Another fabulous Ikora lamp by WMF but smaller than the other one on the site. This lamp was also made by the German company WMF (Württembergische Metallwarenfabrik - Wurttemberg Metal Factory) during the Art Deco period. The bulbous base is raspberry red marbled glass with "flashes" of marbled orange/red. It has chrome fittings with a double lamp fitting at the top and a single lamp fitting in the bottom that illuminates the interior of the base to show the glass off to its best advantage. The stem screws into the top of the base and is retractable. It has been wired to permit adjustment to its height, we would not recommend frequent adjustment as this may cause chaffing and pulling of the electric cable that is inside it. 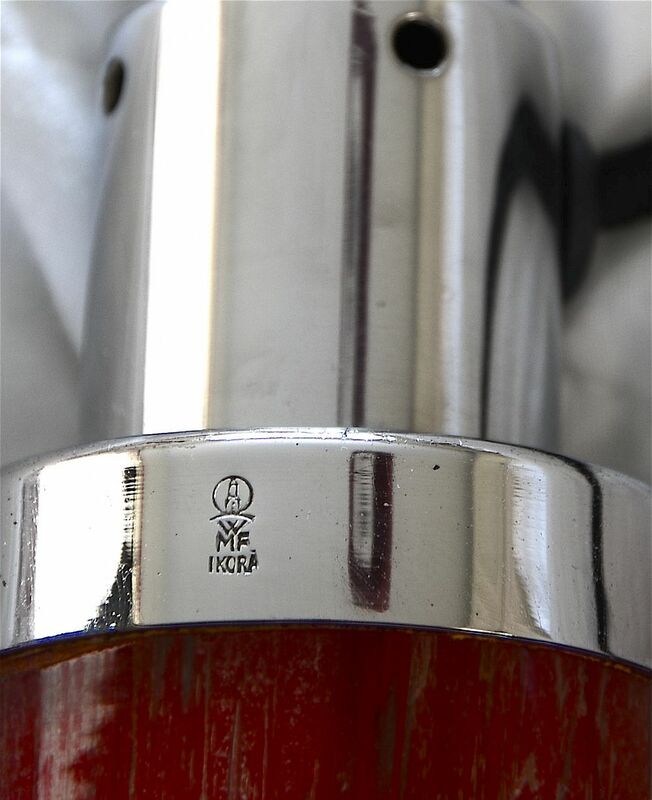 The edge of the chrome top is marked "WMF" and has the windmill mark. The stem is retractable but we would recommend that it is kept at one height and not constantly changed to avoid chaffing and pulling the cable that is inside the stem.